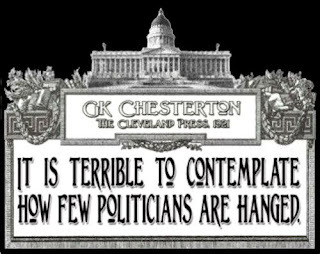 The men whom the people ought to choose to represent them are too busy to take the jobs. But the politician is waiting for it. He’s the pestilence of modern times. What we should try to do is make politics as local as possible. Keep the politicians near enough to kick them. The villagers who met under the village tree could also hang their politicians to the tree. 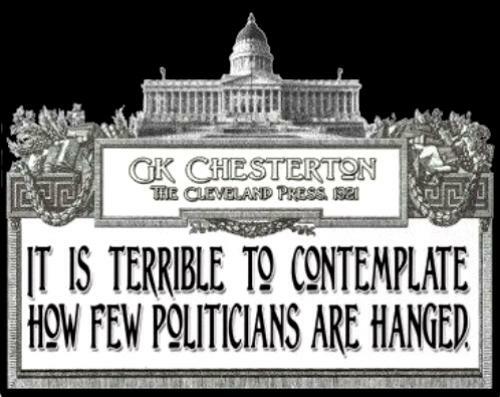 It’s terrible to contemplate how few politicians are hung [sic] today. The image is also from the post at Power Line.